That line, several others borrowed from the master himself and a whole bunch created in his style and/or honor fuel the constant humor and occasional pathos of Christopher Durang’s Vanya and Sonia and Masha and Spike, which opened last night at Houston’s Alley Theater. If any additional bittersweetness were required, a la Chekhov’s Cherry Orchard, the theater itself is about to be closed for a yearlong renovation and modernization, with next season to be performed at the University of Houston. That’s a whole lot like The Cherry Orchard, in fact. Durang’s play picks both low-hanging and hard-to-get fruit from the Russian playwright’s greatest hits album – from the jealousies and hysterias of people “wasting” their lives to the serio-comic desperations of people the world assumes are happy. Hope and despair lurk side-by-side under every rock around the inherited country house in Pennsylvania whose upkeep is paid for by semi-talented movie star Masha but that’s lived in by her brother Vanya and adopted sister Sonia. The two siblings have done little with their adult lives except ease their parents’ final years; with them gone now, the two see nothing of interest on the horizon. On any given day, it seems, that is or is not okay – the source of much utterly Chekhovian angsting over “what’s it all about.” At the same time, the play’s early scenes are both send-ups and serious – until Masha turns up for a visit, with her latest boy toy Spike in tow in the aftermath of her five failed marriages. No further background is required (really, probably not even that) to thoroughly enjoy Vanya et al as directed by Jonathan Moscone. The Alley does this comedy the way it does virtually every comedy – full-bore, over-the-top, with the company’s greatest fear being a moment when nobody is shouting, over-emoting, throwing something or falling down. At important junctures, it seemed to me that a little more “dare to bore” might have been good for Durang’s play, to let its serious or even profound observations sink in. Still, there’s no doubt this is a wickedly funny evening of theater, whether you know your Chekhov backwards, forwards and sideways, or not at all. 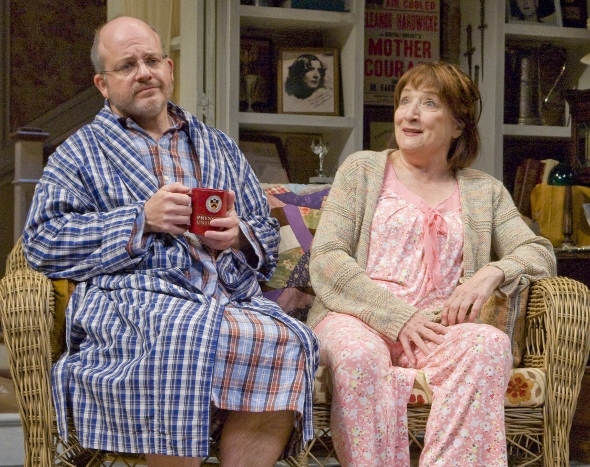 Jeffrey Bean and Sharon Lockwood are terrific as the life-becalmed brother and sister, channeling every family member trapped amidst nature’s beauty between The Seagull and On Golden Pond. Lockwood is pitch-perfect near the end, when she receives what may be her first-ever phone call from a suitor, a tangle of contradictory emotions that together point the way toward hope. And Bean is dazzling in his otherwise bizarre monologue attacking technology and the isolations of modernity in preference for Ozzie and Harriet (you can Google them, children), Mickey Mouse Club and coonskin caps. Last night’s audience, most of whom could remember and prefer right along with him, felt little choice but to applaud the sentiment. Josie de Guzman follows the Alley party line in terms of comic style, being goofy and loud and more than a little manic in her desperation, while Jay Sullivan does a fine job of playing Spike in limited amounts of clothing, making every guy in the audience feel dreadfully out of shape. 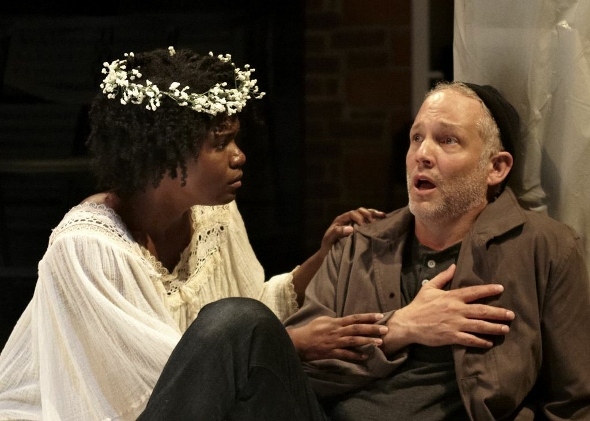 Sarah Nealis is idealistic and touching as Nina, the young acting hopeful who takes an affectionate “Uncle Vanya” interest in Bean’s character – while Rachael Holmes as Cassandra rules the stage every time she’s given some new hilariously dark pronouncement to make. As the family’s “cleaning lady,” she’s a soul sister who’s wandered into Greek tragedy by accident. And like so many of us in the Chekhovian sense, she’s fallen and she can’t get up. Photos by Jann Whaley: (top) Jeffrey Bean and Sharon Lockwood; (bottom) Jay Sullivan and Sarah Nealis. How is it possible, you will ask yourself walking out of the Hobby Center, that you’ve just watched a play about the dark, dreary and impoverished English countryside giving way to the horrific trench warfare of World War I – and it still managed to be the most visually beautiful piece of theater you’ve ever seen. 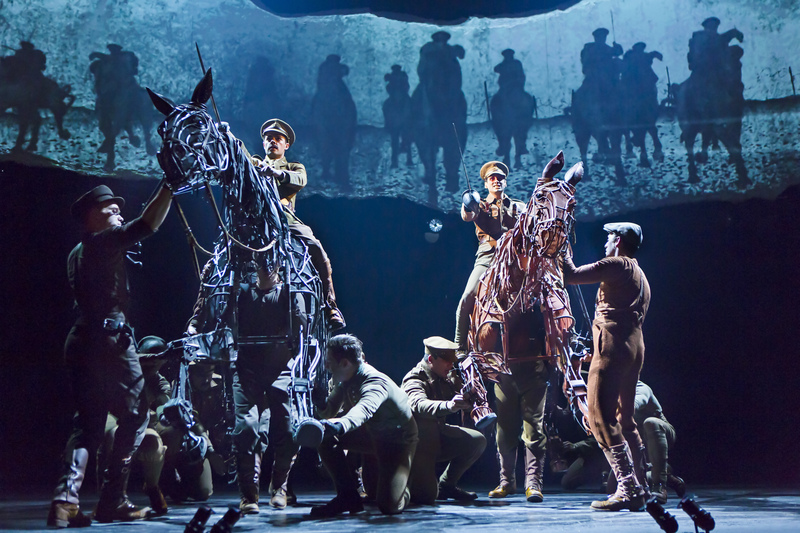 The self-answer to your self-question has everything to do with the National Theatre of Great Britain’s evocative, poetic rendering of War Horse, a book that has also become a popular film by no less than Stephen Spielberg. Having now experienced the current touring production at the Hobby Center, I’m tempted to believe this story of “a boy and his horse” was destined for the stage all along. Then again, that took some doing. Foremost, there’s the little matter of the horse. A showbiz axiom is to never work with children or animals, and in anything titled War Horse, it seems somebody’s going to have to. The single most magical and unforgettable decision made by the production team working to stage Michael Morpurgo’s novel was inviting the Handspring Puppet Company to create the horse named Joey and his equine pals. More than any similar stage illusion I’ve ever seen, including the clever-enough animals in The Lion King, these horses manage to be so realistic that we “pay no attention” to the men walking them around yet also so powerful and lyrical, all mane and tail and muscle, that they become a kind of visual poetry. The story takes a while to get going: slow-witted country man buys horse to best his estranged brother at a village auction, gives said horse to his teenaged son (who shows a special skill at training the animal) but then accepts an offer to sell the horse to the British Army heading off to fight the Kaiser in Belgium and France. Fearing for his best friend’s life, the teenager will eventually enlist in the infantry and go off to find him amid the carnage. 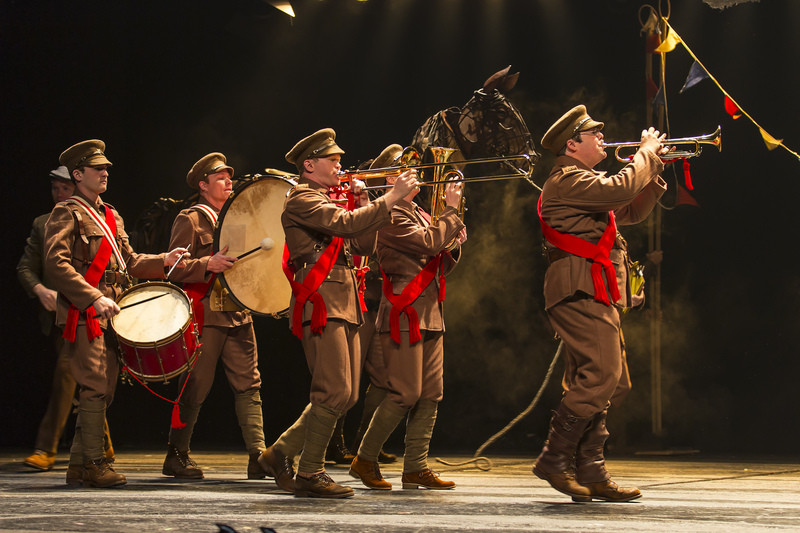 The final poetic component of War Horse is music. Yes, this is that oddity at the Hobby Center: a play rather than a musical. But it does come packaged with a kind of Greek chorus – ranging from one guy up to most of the cast – walking through the action (unharmed) and dazzling us with a keening, Celtic-sounding refrain that supplies the show’s major themes of suffering, courage and sacrifice. Taken together and mingled with a master’s touch, these three elements, each worth enjoying on its own, become a sustained piece of remarkable theater. As most of us understand by this point, William Shakespeare turned out a whole bunch of plays in several different categories – tragedies, comedies and histories being the best known. And for the most part, he was careful to color inside the lines. In his bizarrely affecting The Winter’s Tale, however, Shakespeare seems to delight in tossing crayon strokes in all sorts of unexpected directions. In that light, it’s even more unexpected how engaging the play can be. 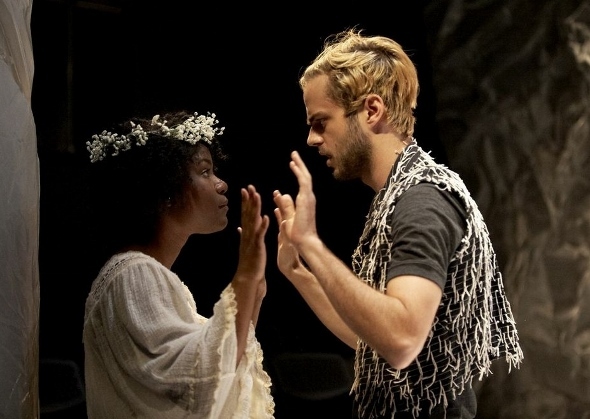 By staging Winter’s Tale in a modern and minimalist way, Houston’s own Stark Naked Theatre Company is taking on one of my fondest theater memories: seeing the play at the Bard’s Stratford-on-Avon during the bicentennial summer of 1976. I remember knowing nothing about the play when I took my seat for that matinee, yet feeling tears fill my eyes as the ending neared. It is a strange show, no doubt about it – an extended (and now more intense than ever) stretch of tragedy, a brief spurt of comedy that’s actually funny, and then a flourish of crystalline poetry at the end that should affect almost anyone the way it first affected me. Though the production that opened last night at Spring Street Studios is impressively polished, there is an intriguing backstory. Just days before the show was to open, Stark Naked co-founder Philip Lehl was the director and another accomplished actor had the lead role, Leontes. When that actor felt he had to drop out, Lehl felt he had to step in. The opening was pushed back a week so he could learn the many, many speeches, and co-founder Kim Tobin-Lehl (a respected acting coach) stepped in to help her husband and the rest of the cast prepare. None of this backstage drama (or trauma) is evident when you’re watching Winter’s Tale. The story is one of the darkest imaginable: an ancient king decides, on very little evidence, that his wife is being unfaithful with his best friend. That “other man,” also a king, manages to escape back to his own land, but the wife and the son die and a newborn daughter is sent far away – to that other kingdom. Years pass. The first king, Leontes, painfully aware of his own recklessness, does little but mourn his life away. But that life, though mourned, awaits him with healing, with a kind of miracle, in the future all the same. In giving us a thoroughly satisfying, believable and ultimately touching Leontes, Lehl gets solid help onstage from Los Angeles-based actor Luis Galindo as best friend Polixenes – and since virtually all the actors take on several roles, also as a servant who carries the near-mythical baby to that distant land. Women are an important part of the mix, even when they’re playing men – and that means Tawny Stephens as doomed (but innocent) wife Hermione and Courtney Lomelo as Paulina, a woman who seems to be orchestrating the sad king’s salvation. Truly eye-opening is the work of young Shunte Lofton, who’s still studying acting at U of H. She convinces us first as the king’s affectionate son but ultimately as his banished daughter, whose own coming into love helps move the metaphorical calendar from winter toward spring. With flawless comic timing, the rest of the cast takes on role after role, often changing a hat or a coat in front of us to mark the change, then emerging as an entirely different person. The delights in this seem to never end, whether it’s Jeff McMorrough as Camillo, Mike Sims as Autolycus or Matt Lents as Florizel. In one of the play’s most entertaining touches, Shakespeare’s often-used lower-class “rustics” are served up with Texas redneck accents. Like so many things about Stark Naked’s Winter’s Tale, it doesn’t seem like it ought to work. But it does.